The first mindfulness is the Mindfulness of the Guru. Traditionally, that was not a sensitive issue at all. The early Indian stories and the stories of the Indian mahasiddhas will confirm that. However, to receive teachings from a qualified master was known to be a difficult point. Many of the early practitioners were ready to sacrifice their lives for even one verse of teaching. 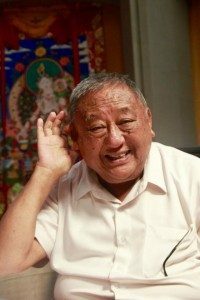 You find a number of examples in Buddha’s Previous Life Stories [Jatakas] as well as in the biographies of Naropa and Marpa, which are now available in English through Trungpa Rimpoche’s Dharmadhatu organization. There you will see how many sacrifices and difficulties they had to endure for the sake of the teachings. When there’s no guru there’s not even the name of the Buddha. The thousand Buddhas of this fortunate eon totally come out of the guru. The yidam and mandala is my manifestation! And the mandala dissolved into the heart of Naropa. Marpa and Milarepa’s relationship is another example. Marpa kept on beating Milarepa all the time. Marpa used to kick Mila out of the teachings, saying, ‘These teachings are not for free, what are you going to give me?’ Marpa’s wife Dagmema felt bad and gave Milarepa her turquoise jewelry to give to Marpa as payment. When Milarepa presented them, Marpa recognized them and said, ‘These are mine. Are you stealing my things?’ And he beat him up more and threw him out. Milarepa and Marpa’s wife then had a conversation with Ngogdon Choje Dorje, one of the Four Pillars of Marpa’s disciples13. He had come to Marpa with his own group of disciples, with a hundred mules and many offerings in order to take more teachings. Milarepa and Marpa’s wife convinced Ngogdon Choje Dorje to give teachings to Mila. He didn’t really want to but felt obliged by Dagmema. So he gave Milarepa some teaching. When Marpa came to know about that he called Ngogdon, got hold of him and beat him up badly. Of course he beat up Milarepa too. (This is all recorded in Milarepa’s biography.) Then he told Milarepa that he wanted a house for his son and made Milarepa build this huge thirteen- story tower and tear it down again three times. First he wanted him to build a square one and half way through scolded him, ‘Who told you to build a square one, take it down and put every stone back where you took it from. Put all the mud back into the ground. I want you to build a round tower.’ Half way through the completion of the round tower, again he scolded Milarepa, ‘Who told you to build a round one? Take it down.’ This happened three times. Finally, according to Marpa’s design the house became a thirteen story tower, with a tiny area at the top. It wouldn’t even stand properly, but it can still be seen today. It looks more like a three story building, but the books and teachings talk about thirteen-stories. Maybe it’s thirteen layers. In any case it was a useless construction, resembling a light house, in the middle of an 11th century Tibetan village. Despite all of this, the guru devotion has never been a sensitive issue until recently, because certain people have abused it and taken advantage of it. In the early sixties we went through a difficult time with that and now it is a sensitive point. On the other hand, the guru devotional practice is called the root of all development. If you don’t have a root, no tree will grow. Without roots, roses won’t grow. Although, one time, there was a year where some roses wouldn’t bloom at my house, so I took them out. but next year one branch came up and bloomed - without root! So maybe what we normally say is not always true. but it was only one branch, and the flower did not have multi-layers, and was not big enough anyway. So it remains: without root the flower doesn’t really grow. And the guru is the root of all development.